If you own the Borderlands 2 Pass, DO NOT purchase this content here as you will be charged again. Borderlands 2 required; sold separately. Xbox LIVE free membership required. 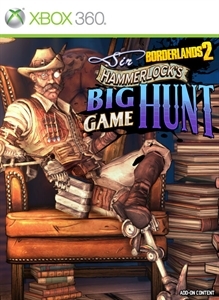 In Sir Hammerlock’s Big Game Hunt players will enter an uncharted territory deep in the swamps of Pandora where a massive Hyperion ship has crashed. The wreckage is rumored to have stockpiles of loot. But watch out, mutated creatures, and armies of savages also have an interest in the ship. As ferocious and primal as they may seem, the mysterious Professor Nakayama claims to be their diabolical leader, and he’s calling all the shots. Includes new guns, new loot, new bosses, a new location, a new vehicle and new skins & heads.